A T Tauri star is a young stellar object no older than a few million years. They are strongly magnetic, still surrounded by the disc of gas and dust from which they formed â and within which planet are born. 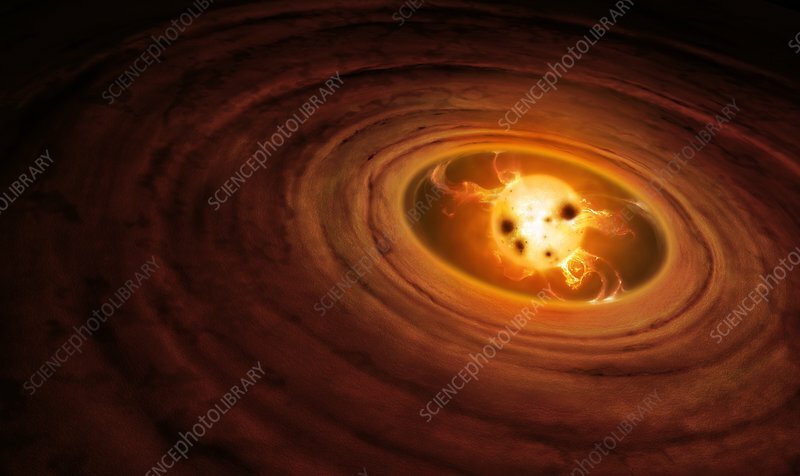 The powerful magnetic field of the star sweeps out a hole in the central region of the disc, somewhat like a whisk in batter. Where the field lines intersect the inner edge of this disc, great globs of gas are wrenched out, falling inwards towards the stellar surface. Where they hit, enormous flares are generated.